―Marge Simpson in Brick Like Me. Marge Simpson is a minifigure released in 2014 as a part of The Simpsons theme. She is the wife of Homer, and mother of Bart, Lisa and Maggie. The three versions of Marge have the same head mould. Marge has upright blue curly hair, at the top of her hair it is hollow (so a child won't choke, if swallowed). Marge has a bright yellow head. At each side of her head, Marge has a rounded circle with a line in it, representing her ears. She has indented large circular eyes. The eyes always have a black pupil in them. Under and between her eyes Marge has a round nose. Marge's upper lip is facing out, giving her a smile. In 71006 The Simpsons House Marge's eyes are half open. There bright yellow top, then separated by a black line and they're white. Marge's torso is bright yellowish green and has a white on it apron. Her torso at the top has a red necklace on exposed skin, the sides of the torso have earth green feminine curves. At the back her torso is the same, besides the apron is tied in a bow knot. Marge's apron continues onto the front of her bright yellowish green dress piece. Marge's hips are white, her legs,arms, and hands are bright yellow. 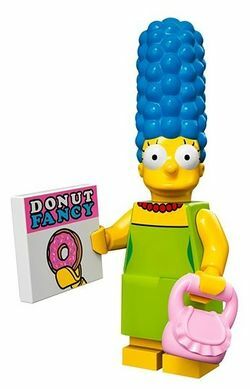 In 71005 The Simpsons Series and 71016 Kwik-E-Mart Marge is in her normal variation. Her eyes are now full and have four black eyelashes sticking out of each. Marge's torso is mainly bright yellowish green Her torso at the top has a red necklace on exposed skin, the sides of the torso have earth green feminine curves. Marge's apron continues onto the front of her bright yellowish green dress piece. Marge's hips are now bright yellowish green, her legs,arms, and hands are bright yellow. In 71009 The Simpsons Series 2 Marge is in her Sunday best. She wears a bright orange torso, with dark orange feminine curves at the side. She wears short bright orange sleeves and white evening gloves. Her dress piece is now bright orange and has a black swirly line going through it. Her hips are bright orange and her legs are bright yellow. Marge met Homer Simpson in high school and the two fell in love. Despite Homer messing things up several times, Marge still loves him as he allways has and will love her. Marge also loves her three children, Bart Simpson, Lisa Simpson and Maggie Simpson, and pet dog Santa's Little Helper. On the outside, Marge may look like an average American housewife with a three-foot-tall hairdo, a green dress that she wears every single day, and a necklace made of big red circles. But anyone who would actually enjoy being Homer’s wife and Bart’s mother is a force to be reckoned with! Marge Simpson On the outside, Marge may look like an average American housewife with a three-foot-tall hairdo, a green dress that she wears every single day, and a necklace made of big red circles. But anyone who would actually enjoy being Homer’s wife and Bart’s mother is a force to be reckoned with!